Try some rhythm basics with a lesson on strumming and staying in time. 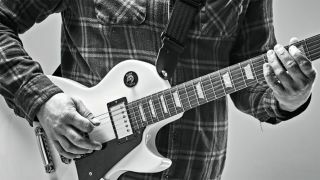 The most common rhythm guitar technique involves using a down-up strumming movement. You’ll need a pick (aka plectrum) to strum the strings with and you’ll need to aim for an even, steady motion. Listen to Kurt Cobain’s E-G progression on Nirvana’s About A Girl or Glenn Frey’s acoustic rhythm in Take It Easy by the Eagles for some inspiration. No worries - with the basics under your belt, timing is the next thing to practise. Try to ‘feel’ the musical pulse in the music you listen to; it’s the rhythmic beat that you might clap or tap your foot to. If you’re jamming along to some music you’ll need to try and synchronise your strumming with the pulse. In most songs your downstrokes will fall on this strong pulse, with upstrokes coming in between. Get started by playing through our first tab example below. Use a down-up strumming motion and count ‘1 & 2 & 3 & 4 &’ to help keep time. Downstrokes should fall on the numbers. Upstrokes are in between. All you have to learn from the fi rst example is how the downstrokes and upstrokes fi t in with the drums and bass backing music. The next step is where things start to get interesting. Sticking with our down-up strumming pattern, try missing the strings on one or two strums; keep moving your strumming hand down and up, just don’t make contact with the strings. Most strummed rhythm guitar parts are based on down-up style strumming - missing out a few strums here and there breaks things up and gives more interesting rhythms. Now would be a good time to look at our second tab example, which demonstrates the idea. In bar 1 the second, fifth and eighth pick strokes are left out; in bar 2 the fourth and eighth strokes are omitted. Practise each bar individually first. Remember, keep your down-up strumming going at all times - it’ll keep you in time. New rhythms are created simply by missing the strings on certain strokes. Why not try mixing in some new chords with the strumming patterns you’ve been looking at? Choose two or three chords you like to play, then change between them keeping your down-up strumming motion going as you go. You’ve practised some rhythms, now why not try a few different chords with your strumming patterns? We’ve provided a backing track that follows an E-D-A chord progression for you to jam over. If you happen to know the minor versions, Em-Dm-Am will also work over the backing. Place your first, second and third fingers in the fret positions shown with dots and press on the strings. D also uses the first, second and third fingers. Black dots indicate root notes, so here the black dot is a D note. Again we’re using the first, second and third fingers. Also try second, third and fourth fingers.